3. Plastic bags can be placed horizontally or diagonally to prevent the product from flowing out of the bags. 4. The unit can be equipped on a production line for continuous operation. 5. The sealed mouth is attractive and upgrades value of product. 6. Suitable for packing candy, cookies, agricultural products, peanuts, seeds and general plastic bag packaging. 1. Conveyor size (LxW): 1100 x 200. 4. Dimension of goods (LxW): 50-250mm (L), 20-300mm (W). 5. 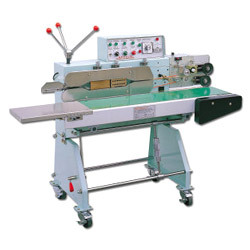 Machine size (LxWxH mm): 1410 x 580 x1120. 7. With data printing. Ink Printer: 1. W: 30mm x OD: 35mm. 2. Font: R big word: L: 6mm x 3.5mm; R small word: L: 3mm x 3.5mm.